Mary is a very studious girl, she loves her braids, she asks her mom to take her to the salon to make it a beautiful hairstyle to go to school. Let's help the stylist to wash your hair, apply a moisturizer and removed with water, then dried hair to make it very smooth and hair is facilitated. Braid choose one you like and start making step by step how you'll indicating the stylist. Be patient because it is not so easy to make. Make shine Maria placing a beautiful accessory in her hair. 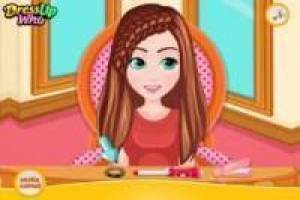 Enjoy the game Funny braids for school, it's free, it's one of our comb games we've selected.